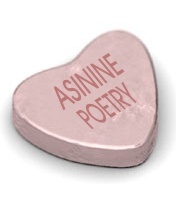 Home>Asinine>Le February Issue of Asinine Poetry Is Up! Le February Issue of Asinine Poetry Is Up! If you love us, you'll follow us on Twitter and Facebook. Our February issue is up, with a logo rejiggered by Ern especially for the month.